Download free sewing pattern in A3 Format or in A4 Format. Start making the body of the whale. Trace and cut out the pattern. Sew the notches in the upper part of the body closed. Do the same for the bottom of the whale. Continue with the fins. With right sides facing, pin down the fin-fabrics. Sew the fin-pattern to the fabrics. Do not sew the bottom of the fins. Turn right-side out. Cut out the nose and eyes patterns from the felt sheets. Use a sewing thread to sew the felt pieces to the body part. Embroider the pupils on the eyes. Place the front body piece right-side up on your work surface. Pin the fins into position. Place the second body piece right-side down on top and pin the body pieces together. Sew the body pattern. Be careful not to sew the stuffing opening. Double- stitch over the fins. Turn right-side out. Using a stuffing stick, push small amounts of stuffing into the whale until the whale is firm and even, but not too tight. Hand-sew the stuffing opening closed. I love this whale, and the fish. I've been looking for a softie that would work for a baby boy, and both of these are perfect! I do have one comment about your English. I don't know where you are from, but I wish I spoke your language as well as you speak mine. If you hadn't added the note, I would never have thought about English being your second language. thank you so much for this great pattern! Thank you so much for your free whale pattern. My eldest granddaughter just loves whales and I'm going to make one to put with her Christmas parcel this year. I tried this as my very first sewing project...It came out better than I expected! I used buttons for the eyes because I'm just keeping it for myself, not giving it to a child ;) Thank you so much for this!!! here's mine- doesn't look like he has fins...but he does! IT IS SO FONNY. I NEED TO SEW FOR MY OFFSPRING NOW. Thank you for your free Whale Pattern! My daughter is studying the Blue Whale for school and needs to do a take home project. She wanted to Sew a whale and this pattern is the most realistic as far as porportion. She's excited to have a project that will be something she can cherish! thank you for the pattern! It's so cute! Thank you so much... it really looks great! My son loves his whale, thank you for the pattern! I love it ! I,m going to make one for my grandson and then I,m going to make him out of 100% cotton material and fill him with wheat grains and he can be my micro- waved ,hand warmer or my chilled in the freezer , headache soother. ...for me ! : ) Thanks for sharing ! 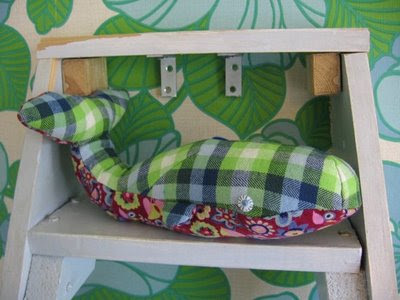 I sewed a whale for my son. He loves it! Thanks for the pattern. Hi, just wondering if you cut to the solid or dotted lines? Hi Kate, you cut the dotted lines and sew the solid lines. Thank you so much for the pattern. I made a small foot long whale with it. This whale is so lovely. I especially like the details on the tail so that it would bend. Thank you for sharing.